How to make quick and easy creamy vegetable soup with only one pot in under 35 minutes. 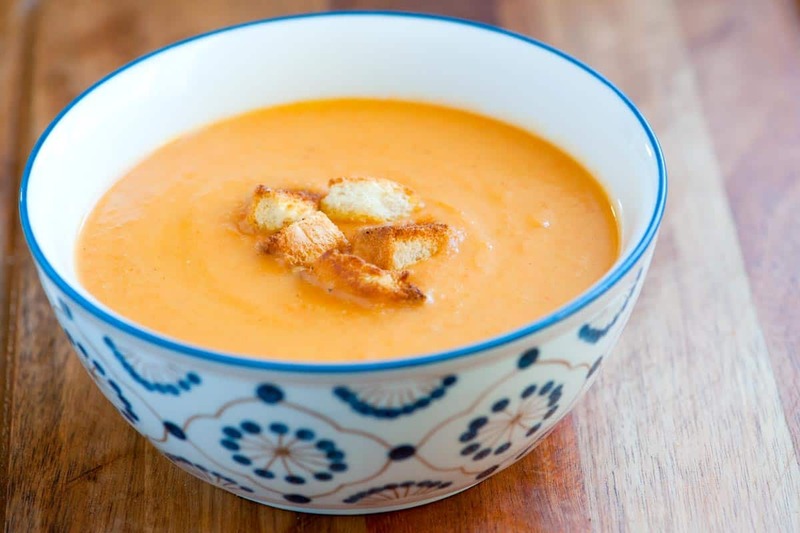 Jump to the Creamy Vegetable Soup Recipe or watch our recipe video showing you how we make it. We have been making this soup for years. 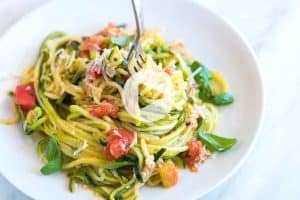 It’s simple to make, healthy, and comforting. Throw lots of vegetables into a big pot, add stock and herbs, and then simmer until done. Blend with a little cream or coconut milk, and you are done. If you are looking for a brothy vegetable soup, try our Easy Homemade Vegetable Soup (it’s made with lots of veggies and a light tomato broth). 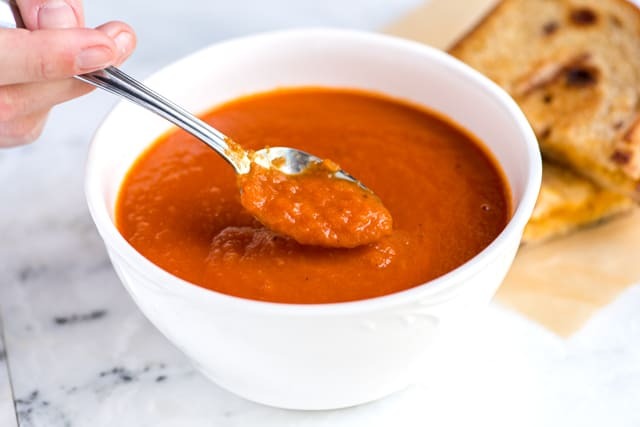 Try this Three Ingredient Tomato Soup Recipe with butter, tomatoes — canned or fresh, and onion. After some simmer time, it turns into a velvety, delicious tomato soup. A must make! The real trick to making this soup is cutting all the vegetables a similar size. We start by cooking onions, carrots, and celery in a big pot until softened. Then we add potatoes, garlic, stock, and herbs. After simmering for 15 minutes, the vegetables will be soft. Remove the herbs (I cannot even count how many times I’ve forgotten a bay leaf!). Then blend the soup until smooth. At this point, we like to add a splash of cream or half-and-half. You can skip it or use a dairy-free option like coconut milk. Here’s another easy soup recipe: Try our Easy Sausage and Potato Soup. It’s delicious! Or try this Simple Ham and Cabbage Soup! Gluten-free Vegetable Soup: Some store-bought stocks contain gluten. Look for stock or broth that mentions it is gluten-free on the packaging. You could also consider using homemade stock. 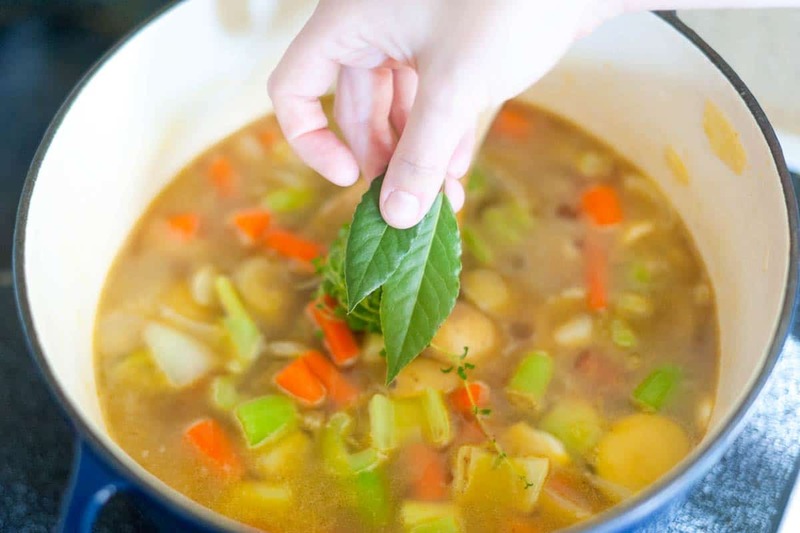 Vegetarian and Vegan Vegetable Soup: Replace the chicken stock with vegetable stock. For the best flavor, we recommend one that’s heavy on mushrooms. Instead of the cream, use coconut milk. You could also add some drained and rinsed white beans to the soup while it simmers. Once blended, they will add to the soup’s creamy texture. 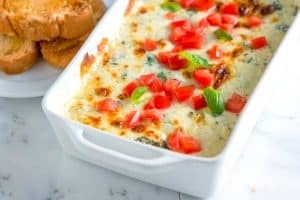 Refrigerate the soup for up to 3 days. Or, freeze up to 3 months. The soup will become very thick after freezing. When reheating, add more stock or water to thin it out until your desired consistency. 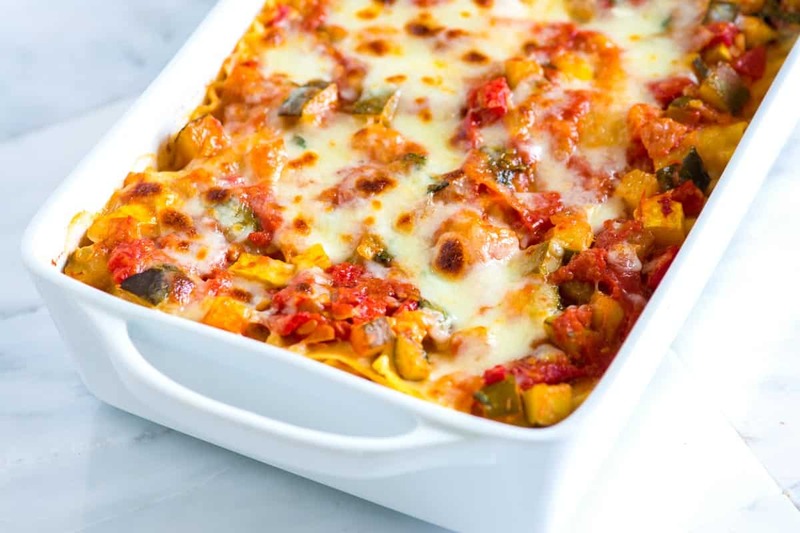 Take a look at this Easy Vegetable Lasagna Recipe with tender zucchini, yellow squash and roasted red peppers cooked in a light tomato sauce. Chop the onion, carrots, and celery into 1/2-inch chunks. 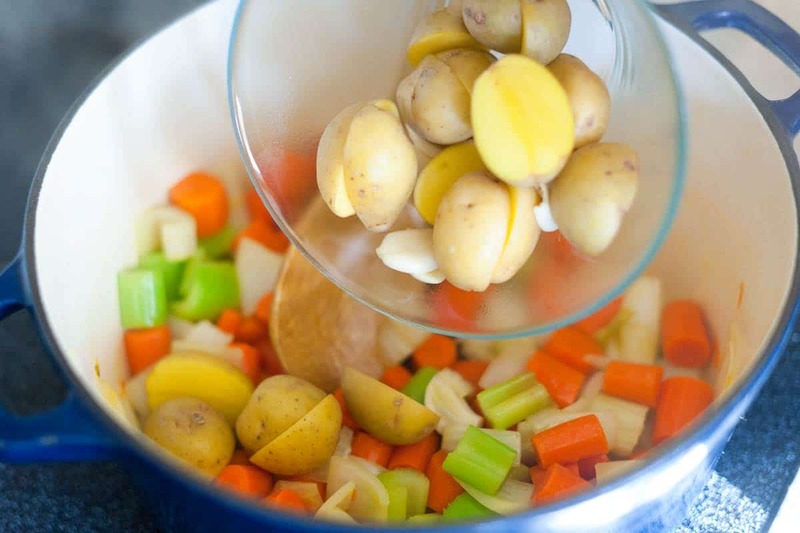 Chop the potatoes into 1/2-inch chunks, but set aside from other vegetables. Heat the oil in a large pot over medium-high heat. Toss the onion, carrots, and the celery around in the oil. Sprinkle with a 1/2 teaspoon of salt and add the red pepper flakes. 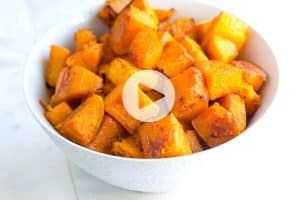 Cook, stirring occasionally, until the vegetables sweat, soften, and smell sweet; 5 to 10 minutes. Stir in the potatoes, garlic, bay leaves, and thyme. Cook for 5 minutes. (Add more oil if the pot seems dry). Pour in the stock and bring to a boil. Reduce to a simmer and cook until you can easily pierce the potatoes with a fork; about 15 minutes. Remove the soup from the heat. Take out the bay leaves and thyme sprigs and discard. 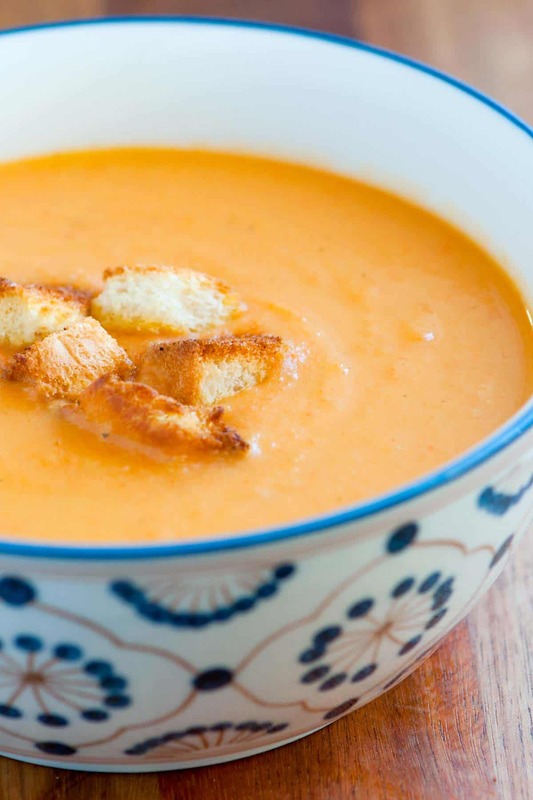 Use an immersion blender, stand blender, or food mill to puree the soup until smooth. Stir in the half-and-half. Taste for seasoning and adjust with more salt and pepper if necessary. Nutrition Facts: The nutrition facts provided below are estimates. We have used the USDA Supertracker recipe calculator to calculate approximate values. We did include 1/4 cup of half and half in the calculations and assumed 4 servings. We omitted salt from the calculations since you will need to add to your tastes. I made it exactly as written – but substituted zucchini for the celery. I LOVE this soup! So easy and so delicious. My kids don’t even know its made with veggies :). If you like your soup more savory (as we do) throw a parmesan rind in there as its simmering. Thanks for the great recipe! I made this soup today and my husband really liked it! Thank you for the recipe! Great soup! I left out the milk/coconut milk option cause I didnt think it necessary once I pureed it (im sure its great in). I was nervous the cocnut milk would mask the goergous flavors of the veg and make it a tad tropically. I used parsnip as well! I’ll look forward to making more variations of this soup. Thanks for the recipe, i used to work in ireland and miss the daily veg soup so much! 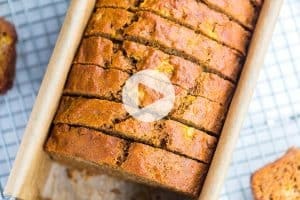 Have you thought of doing a carrot and coriander recipe? if not, I encourage ye too! I first made this for a friend who was going to have trouble eating after surgery. I did half the potatoes and added a can of white beans just for added protein. Kept everything else the same (well, except I used heavy cream because I had it on hand.) It is SO good! I have now made this 3 times (including just now) in the last 2- 2 1/2 weeks!! IT IS REALLY GOOD! THANK U! !